comets are commonly called what ? what is the length of a year ? what are the parts of a comet ? what is the size of a comet normally ? size of a comet changes depending on how close it is to the sun. a comet gets closer to the sun, the ices on the surface of its nucleus vaporize and form a cloud called a coma around the nucleus that can expand out to 50,000 miles (80,000 km). whats the composition of a comet ? composed of an amalgamation of rock, dust, water ice, and frozen gases such as carbon dioxide, carbon monoxide, methane, and ammonia. what is the distance of a comet from the sun ? 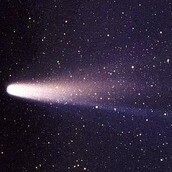 where does the comets originate ? Kuiper Belt and the Oort Cloud. Each of these regions contains billions of comets, but they have so much room in these vast rooms of space that they don't get any closer to each other than we on Earth do to the sun. what are 3 distinguishing characteristics of a comet ? Whitlock, Laura. Comet West. N.d. Nasa, n.p. Erickson, Kristine. Coronagraph. 2011. Nasa, n.p. Liller, Nasaw. "Halley Comet." N.p., n.d. Web. 2 missions that have explored the comet ?